Takeaway: Workers must be kept safe emotionally and professionally before we can keep them safe physically. We all love patterns because patterns comfort us and put us at ease by helping us understand our surroundings. Our brain is a pattern-seeking machine. It is always looking for dots to connect. When we pull into a parking lot, we notice the parking rows, we see organization. Cover that same parking lot with snow, and our anxiety levels go up because our pattern is gone and we don't know where to park. When we step into our favorite fast food restaurant, we see the counter, the tables, and chairs. We understand our surrounding and know how to act. Most fast food restaurants will follow this same floor layout or pattern because changing things up too dramatically will throw us off and make us uncomfortable. One of the main reasons safety initiatives fail is that they do not recognize this three-level pattern. We cannot ignore people’s emotions and job security and expect to have them work safely. Any of us would be tempted to take physical risks if our jobs or pride were on the line. We cannot ignore the first two levels of safety and expect the third level to stick. It is up to management to create a culture where workers feel safe on all three levels. We will put ourselves at risk physically to protect ourselves emotionally. No one likes explaining their mistakes, how they failed at a work task, or why they failed to meet a set performance goal. In the work environment, emotional safety means employees feel valued. They see themselves as part of a family or team. They are treated with respect and as more than just an employee (see How to Get Employees and Management on Board with Safety to learn how this kind of involvement can improve safety buy-in). When we know managers care about us, we are aware they would not want us taking risks. When we see they value us, including our safety, so will we. We may not like to admit it, but our sense of self-worth is influenced by how others perceive us. If we see management as friends that care about our emotional well-being, we know they care about our physical well-being as well. If they do not care about our emotional well-being, why would they care about our physical well-being? Most of us like being respected for what we do. We want to be known as that employee that can “git-r-done.” Our work is our livelihood. It is how we provide for our families. We will often take physical risks over losing our jobs due to bad performance. When we feel our job security may be at stake, we may take unnecessary risks to protect our employment. We may use shortcuts such as not taking the time to get the right tools or put on PPE. 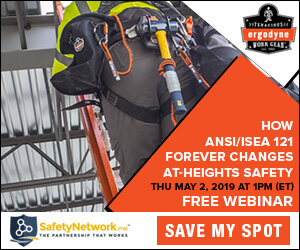 We may decide not to chalk tires or to wear a harness when working at an elevated height. Safety almost always requires extra time and effort. If we feel that performance goals are more important to management than our safety, the extra time and effort will not be given. Employees need to feel valued and as part of the team. They need to feel secure, that a mistake is not going to get them fired or demoted. Many companies such as Toyota, Next Jump, Procter and Gamble, and Southwest Airlines have done an excellent job of establishing that their employees are their number one asset. Toyota management has stated they will never fire an employee for bad performance. They site performance issues as correctable by training and designing better ways of working. They want employees to succeed. Only when we know we are cared about emotionally and professionally will we believe we are cared about physically. The first two levels serve as a litmus test to employees regarding loyalty from management. If we do not feel safe in the first to levels, why believe management means it when they say “work safe" (see Common Safety Cliches & Why They Aren't Helping)? We need to create a work culture where employees feel valued and protected on all three levels. Without the first two, level three will most likely not happen. However, when workers feel valued and protected, physical safety is naturally accepted even if not stated. It just makes sense. When it comes to safety, we must connect the dots in the correct order. Employees need to know they are valued on all three levels. It is up to management to create a culture that makes them feel safe. How about your team? Do your employees feel like you want them to succeed? Do they feel protected by management? Do they genuinely feel like they're part of them team? Meeting their needs emotionally, professionally will lead to protecting them physically. Workers will also be more engaged and loyal. This means fewer accidents on the floor and more money in the bank (see Connecting the Dots: Safety and Profitability to learn more).